FTF gives traveling families tips on how to stay stress-free with easy yoga moves you can do on the place, on the train, in the car or in your hotel room. With flights, luggage, rental cars and hotel bookings to keep track of, traveling can sometimes get stressful. Luckily, yoga can help, even during busy vacations! Yoga offers many benefits, both emotional and physical. It’s a great way to de-stress after a hectic day of travel, or to stretch sore muscles from a day of hiking, skiing or swimming. And with the yoga-for-kids trend sweeping the nation, more and more children are practicing yoga, so it’s become an activity for the whole family. It’s easy to do yoga almost anywhere, so try these easy moves on your next vacation! Especially during the holidays, most of your time at the airport will likely be spent waiting in line, whether at check-in, buying food, boarding the plane, or at the baggage claim area. Luckily, you can use this otherwise wasted time to center your mind and increase balance with Tree Pose: lift one of your feet and place it on your ankle, calf or inner thigh, and balance on the other leg for as long as possible. If you lose balance, switch legs and try again. Balancing on one leg requires a lot of focus, which will keep you from dwelling on all the little stresses of everyday life. Balancing also strengthens the muscles of your legs and stomach, which work together to keep you from falling. Sitting on a plane without moving for hours on end can leave muscles feeling tight. While airplane seats don’t give you a lot of mobility, there are lots of stretches that you can do while seated. You’ll feel refreshed and ready for adventure as soon as you step off the plane! Neck: Stress often manifests itself in tight, cramped neck muscles. Stretch out your neck by rolling your head in large, slow circles. Pause for about 5 seconds at your front, back and each shoulder. Use your hands to pull your head towards the ground, moving slowly and very gently so as not to strain your muscles. Repeat four or five times in each direction until your neck feels more relaxed. Arms and shoulders: Shrug your shoulders and slowly roll them back to release the tight, sore muscles in your upper back. Repeat 10 times, and then reverse directions. To stretch your arms and stomach, clasp your hands together and reach them up above your head. Tilt over to your left to stretch the right side of your body, and then do the other side. Repeat three or four times on each side. Warning: if you’re sitting next to strangers, they may not appreciate being leaned on! But, don’t worry, because you can also do this move standing — try it while you’re in line waiting for the bathroom. Feet and legs: Point your toes to stretch the tops of your feet, and then flex them to stretch the backs of your ankles. Then move your toes in circles, rolling out tightness in your ankles, calves and shins. Reverse directions, and repeat 10 times. Downward dog: Start on your hands and knees. Push your knees away from the floor, reach your heels to the floor and push your rear end to the sky. Hold this position for five seconds, then return to hands and knees. 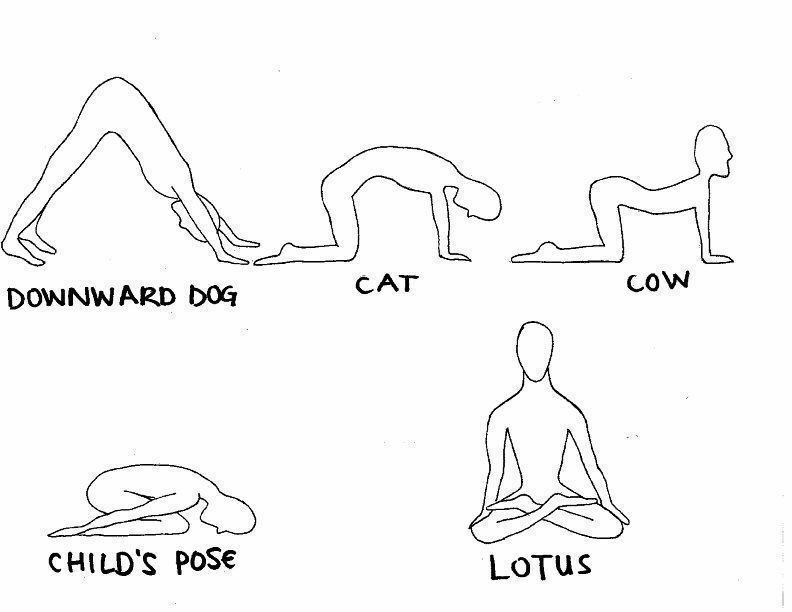 Cat and cow: While on hands and knees, arch your spine towards the sky, tucking your chin into your chest (this is called cat pose because you will resemble an angry cat). Then, arch your spine towards the ground, lifting your chin to the sky (this is called cow pose). Child’s pose: Start by kneeling on the ground. Bring your forehead to the floor with your arms alongside your legs, and rest here for as long as you’d like. Lotus pose: Sit cross-legged on the floor. Put your hands on your knees and close your eyes. Breathe deeply and try to clear your mind. Stay here for as long as you can keep your mind from wandering.